Fungus Among Us!! Since I got back from the Fall Semester at Sea Voyage six years ago, everything had been damp and wet. I’ve never seen a blue mushroom before. This one had a slug feasting it. 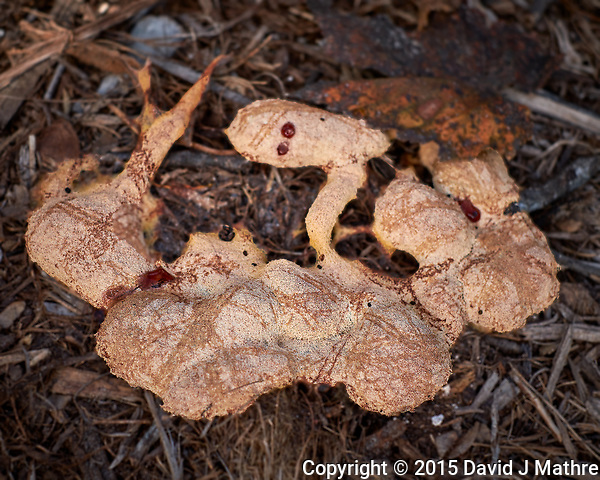 The images in this post are all from my driveway where mushrooms are abundant. One of the backyard Nisse found a new mushroom. I don’t often see him out during the day. Composite of 24 focus stacked images taken with a Nikon D810a camera and 60mm f/2.8 macro lens (ISO 200, 60 mm, f/3, 1/640 sec). Raw images processed with Capture One Pro, and the image stack processed with Helicon Focus. It was too windy to take wildflower pictures outside, and was about to freeze overnight. So I cut six of the remaining wildflowers (Coreopsis, Cosmos, and Black-eyed Susan) and took them inside to shoot. The images were taken with a Nikon D810a camera and 60 mm f/2.8 macro lens. Slide show with 6 images. The wildflower garden was successful last year, so I expanded it significantly this year. Some areas worked, others didn’t. The deer and rabbits nibbled at the edges, but left me enough to take a lot of pictures of the wildflowers. I needed to add an electric fence this year. I think my favorites have been the poppies where I tried many times to do time-lapsed videos of them opening in the morning. It will be interesting to see what comes back next spring. I also cleared two more large sections that will be seeded once the ground gets colder. Gone to See America. December 2015 Florida Road Trip. Day 8: St. Petersburg. “Dog Vomit Mushroom” This fungus came up overnight in the wood mulch. Backyard urban farm in Saint Petersburg. Image taken with a Fuji X-T1 camera and 35 mm f/1.4 lens (ISO 200, 35 mm, f/4, 1/850 sec). Raw image processed with Capture One Pro, Focus Magic, and Photoshop CC. Walkabout in my backyard with a new (at the time) lens. Actually, a 600 mm f/4 lens is a bit too heavy to be used handheld, so I didn’t get many images. A mushroom, a Robin that likes bitter-sweet berries, and a turkey vulture soaring. Backyard Fall Nature in New Jersey. 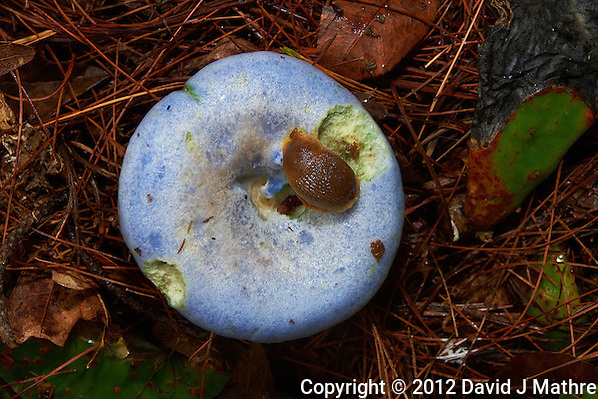 Slug Eating a Blue Mushroom. Image taken with a Nikon D4 camera and 60 mm f/2.8 macro lens (ISO 100, 60 mm, f/16, 1/13 sec) + SB-910 flash.